Los paquetes de software integrado de Advantech "Mejoran la calidad de vida con las plataformas de Advantech conjunto con la tecnología integrada de Microsoft Windows." Nuestros clientes se liberan de las molestias de lidiar con distintos vendedores (proveedor de hardware, integrador de sistemas, distribuidor del sistema operativo integrado) para la ejecución de sus proyectos. Advantech provides powerful yet simple management software services in SUSIAccess, making it easier to manage your IoT devices. SUSIAccess features remote management functions and incorporates system security from McAfee and back-up recovery from Acronis to help customers centralize monitoring and management of remote embedded devices in real-time. Arm Mbed Cloud offers IoT device management capability delivered as a service from the Cloud. Mbed Cloud offers the capability to securely manage “any device” on “any architecture” with “any cloud”. It is Arm’s first Software as a Service product aimed at OEMs. It enables them to simplify connecting, securing, provisioning and updating of devices across complex networks. This allows devices to have flexibility to work with multiple clouds. It offers coverage across Cortex-A& M, and any other device with an included flexible cloud client component. It is optimized to take advantage of the energy efficiency of the Arm architecture on constrained devices through the use of CoAP – the constrained application protocol. Efficient caching capabilities allow reduction of operating costs for networks that need sleepy devices to conserve battery life as well as frequency of communications needed. Security and trust provisioning are built in, end-to-end, and provide security for every device transaction. WISE-PaaS/Security is a central security management console, which is a comprehensive and quickly deployed security solution for the protection of IoT devices. It is ideal for protecting systems that are fixed-function in terms of CPU or memory resources. Its low overhead does not impact system performance, requires very low initial and ongoing operational computing resources, and is equally effective either in non-network standalone mode or in a Cloud. WISE-PaaS/OTA is aimed at remote software updates and supports application, provisioning, firmware, driver and BSP updates. The WISE-PaaS/OTA server can be used to monitor the upgrade process and status, and can configure an upgrade schedule for implementing planned updates. Additionally, WISE-PaaS/OTA supports rollback to a previous configuration for exceptions, and supports shell and batch scripting upgrades for more flexible updates, as well as RESTful API web service, which allows OTA functions to be integrated with other applications. Advantech is partnering with Microsoft ® Azure as the IaaS and also PaaS solution provider through the Microsoft CSP (Cloud Solution Provider) Program in order to offer diverse functions for IoT applications. Through the CSP program, Advantech provides total solutions, from devices to cloud services. Advantech and Microsoft Azure help customers build new-generation products and services for the IoT era. Microsoft Azure is a growing collection of integrated cloud services that allows you to quickly deploy infrastructures and services to meet all of your business needs. Azure’s pay-as-you-go services can quickly scale up or down to match demand, so you only pay for what you use. The predictive analytics services, including Machine Learning, Cortana Analytics and Stream Analytics, are redefining business intelligence. Make smarter decisions, improve customer service, and uncover new business possibilities from your structured, unstructured, and streaming IoT data. 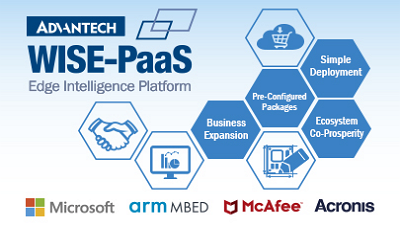 WISE-PaaS/RMM is part of Advantech WISE-PaaS cloud solution, and focuses on remote device management and monitoring. WISE-PaaS/RMM serves as an IoT device management platform that manages connected devices remotely, providing centralized management features, including HW/SW status monitoring, remote control, system backup/recovery, etc. Moreover, it supports server redundancy and hierarchical server management, which increases service reliability and availability. WISE-PaaS/RMM utilizes standard IoT protocol, like MQTT from IBM, to communicate with IPCs, IoT gateways and sensors, provides WISE Agent framework for data acquisition from devices, and offers RESTful API web service, which allows the user to integrate RMM functions with other applications or do further customization. McAfee Embedded Security software is an industry first–a solution to secure embedded devices. McAfee Embedded Security prevents unauthorized changes and will lock a system down to a known application configuration so that no other applications can execute. McAfee Embedded Security solution goes beyond antivirus to more proactive protection on your device, and does it with an ongoing, one-time license–no renewals required. McAfee Endpoint Security 10 is the newest, best-performing, most effective, collaborative protection for McAfee Endpoint Protection Suites customers. It introduces a new framework that allows multiple endpoint defense technologies to communicate in real time and analyze and collaborate against new and advanced threats. McAfee Embedded Security Solution is ideal for protecting systems that are fixed-function in terms of CPU or memory resources. Its low overhead does not impact system performance, requires very low initial and ongoing operational overhead, and is equally effective in standalone mode without network access. We provide four different combinations to satisfy different embedded industry needs. Acronis True Image provides users a quick and easy-operated solution to protect data and recover the entire system even when OS crash. Acronis True Image effectively reduces down-time cost and lowers the risk of data loss. With Acronis Startup Recovery Manager, recover process become more intuitive by selecting the F11 key and follow the guild step by step. And the recovery process takes minutes, not hours. Acronis also provide plenty different ways to backup and store in different ways to satisfied variety users’ needs, such as backup the whole system or selected disk/partition or only the changes full backup, and backup in local drive, external storage, FTP, NAS, or on the system drive using a separate and secure partition(Acronis Security Zone), and so on. All of this makes backup and recovery become even more convenient and much safer to users’ data. Windows Embedded is a group of Microsoft operating systems that are designed to be run and used on embedded computer systems. The embedded computer systems that run these operating systems include small-footprint, real-time devices and Point-of-Sales systems like those in kiosks, small-footprint, headless systems, automotive computers, automation devices, hand held mobile devices, digital signage, and more. Windows 10 IoT is a family of Windows 10 editions targeted towards a wide range of intelligent devices, from small industrial gateways to larger, more complex devices like point of sales terminals and ATMs. Combined with the latest Microsoft development tools and Azure IoT services, partners can gather, store and process data, creating actionable business intelligence that affects business outcomes. Partners building solutions based on Windows 10 IoT will realize expanded opportunities when they harness the full breadth of Microsoft technologies to offer end-to-end solutions. These products are fully functional versions of Microsoft's desktop OS, intended for use in an embedded solution consisting of purpose-built hardware and application software. Developers use Windows for Embedded Enterprise for its visual and differentiated user interfaces, connectivity capabilities, and reliability in building secure applications. It's for dedicated embedded devices that require custom interfaces and fully functioning Windows desktop. Windows Embedded POSReady is a flexible OS designed to seamlessly connect point-of-service solutions with peripherals, servers, and services. In this increasingly connected world, businesses need a platform that helps ease the transition from transaction processing to enhanced customer service and relationship building. Windows Embedded CE/Compact is a componentized, realtime, and small-footprint operating system with full access to the system’s source code. Create devices with an immersive user interface, a rich browsing experience, and a unique connection to Windows PCs, servers, and services by using familiar tools such as Visual Studio. Windows® Embedded Server is binary identical to Windows Server, with built-in security, reliability, and availability features intended for use in an embedded solution consisting of purpose-built hardware and application software. Windows® Embedded Server allows OEMs to more easily design, build, and deploy dedicated solutions. Microsoft® SQL Server® for embedded systems is binary identical to Microsoft SQL Server, and is intended for use in embedded solutions consisting of purpose-built hardware running the Windows Embedded Server Operating System and application software. Microsoft SQL Server for Embedded Systems builds on a strong foundation and proven capabilities, providing OEMs with a robust database for their embedded applications deployed on server appliances. Advantech provides a series of real-time OS services for Advantech platforms, including Wind River VxWorks, Linux and Android Solutions. Advantech provides up-to-date Wind River VxWorks BSP porting services, and customized driver development is available on a per-project basis. SUSI API for VxWorks is compatible with all Advantech hardware platforms by request. Advantech provides three major Linux integration services: general Linux distribution services, Linux driver modification and configuration services, and third party solutions. Advantech provides Android Board Support Package (BSP) Services; we work with Intel® and independent hardware vendors to get the latest embedded drivers. We integrate and produce a fully verified BSP that helps customers quickly build their Android OS solutions. Advantech has created SUSI (Secure and Unified Smart Interface), a suite of application interfaces that lets users directly monitor and control digital I/O, I2C, CPU stepping speed, watchdog timers, and smart fans. SUSI APIs help produce better, more reliable products, with faster time-to-market. Advantech has created SUSI APIs to simplify application development and offer exclusive services with Advantech’s embedded platforms. SUSI APIs make it easier for customers to program and configure features while integrating solutions. SUSI APIs provide a series of functions with a modularized design. Customers can easily implement them to fulfill their application requirements. For outdoor applications, for example, customers can easily configure hardware monitors, thermal protection settings, system throttling, and brightness levels for digital signage players and display control and management interfaces. New platforms can be easily upgraded without effort needing to be expended on redesigning applications. SUSI APIs provide an IoT Translator SDK to assist customers with easily integrating their own devices on Advantech embedded platforms. This SDK effectively plays the role of a translator, allowing plug-in functions to connect to peripherals and run applications. The full functionality of SUSI APIs provides a building block to accelerate development, enhance security, and offer added-on value. Furthermore, SUSI APIs comply with the IoT data communication standards PICMG EAPI and JSON.They also support cross-platform compatibility and can thus easily be applied to third-party applications by using the IoT Translator SDK. Simplify your application development and upgrade. Embedded BIOS solutions deliver the superior performance compatibility and functionality that systems integrators need– through Modularized BIOS, Secure BIOS and UEFI Utility. Multiple options let customers tailor their products to a wide range of designs for their target markets. Advantech provides full-featured Embedded BIOS solutions that deliver the superior performance compatibility and functionality that System Integrators need. A variety of options and extensions let customers tailor their products to a wide range of target markets, with coreboot ready for practical usage. Secure boot options are optimized to make sure POST period before Operation System takeover is secured. Furthermore, it includes a BIOS suite for building custom firmware tools for multiple OSs, such as DMI, BIOS configurations, and modules.